The block-lava effusion at Volcán de Colima, México began on November 20, 1998, after 12 months of seismic activity, and ended about 80 days later. Three types of seismic events were observed during the lava effusion. Volcano—tectonic earthquakes occurred mainly at the very beginning and after the termination of lava effusion. Explosion earthquakes occurred frequently during the period of the maximum rate in lava effusion. The remainder of the seismic signals were associated with pyroclastic flows and rockfalls from the lava dome. These latter signals increased sharply in number at the onset of lava effusion. 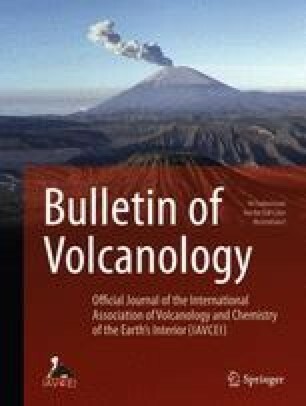 The rate of occurrence remained high when the lava discharge rate decreased but gradually decreased after the termination of lava effusion. Maximum daily durations of seismic signals are proportional to the daily volumetric output of lava, indicating the dependence of the number of pyroclastic flows on the rate of lava output. A log-log plot of seismic signal duration vs. number of events with this duration displays a linear relationship. The short-period seismic signals can be divided into three categories based on duration: short events with durations less than 100 s; intermediate events with durations between 100 and 250 s; and long events with durations longer than 250 s. We infer that long events correspond to pyroclastic flows with mean deposit volume ∼2×105 m3, and intermediate events represent pyroclastic flows with mean deposit volume ∼1×103 m3.